LEGO Friends Heartlake Pizzeria Building Set - BEST price! Home Amazon LEGO Friends Heartlake Pizzeria Building Set – BEST price! LEGO Friends Heartlake Pizzeria Building Set – BEST price! LEGO Friends Building Sets are popular for 6 – 12 year olds. Hurry and get the LEGO Friends Heartlake Pizzeria Building Set today for only $18.99 from Amazon! This is the best price ever on Amazon (by a lot)! Limit 3. 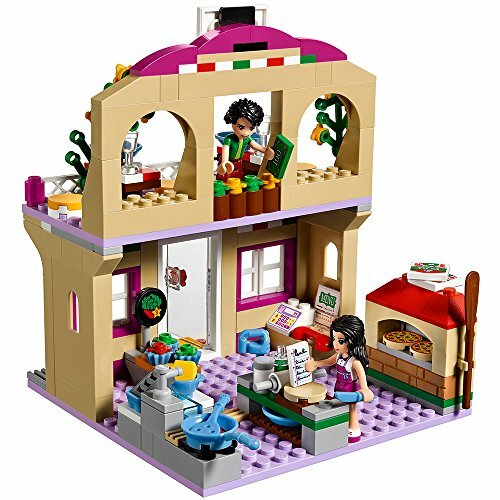 The LEGO Friends Heartlake Pizzeria has all the equipment needed to play at making and baking fresh pizza in the kitchen. Serve them out on the restaurant balcony, or use the phone to take orders then deliver them with Oliver on the scooter. There’s even a stand selling basil and tomato plants to happy customers. This cool toy for 6-year-olds includes two mini-doll figures. Buy the LEGO Friends Heartlake Pizzeria 41311 Toy for 6-12-Year-Olds from Amazon. Previous articleALEX Spa DIY Bath Bombs – Best Price!